To celebrate, we are sharing some really delicious and seriously chocolatey cookies with all of you. They are very much like a brownie, but are easier to transport because they hold up as well as cookies. 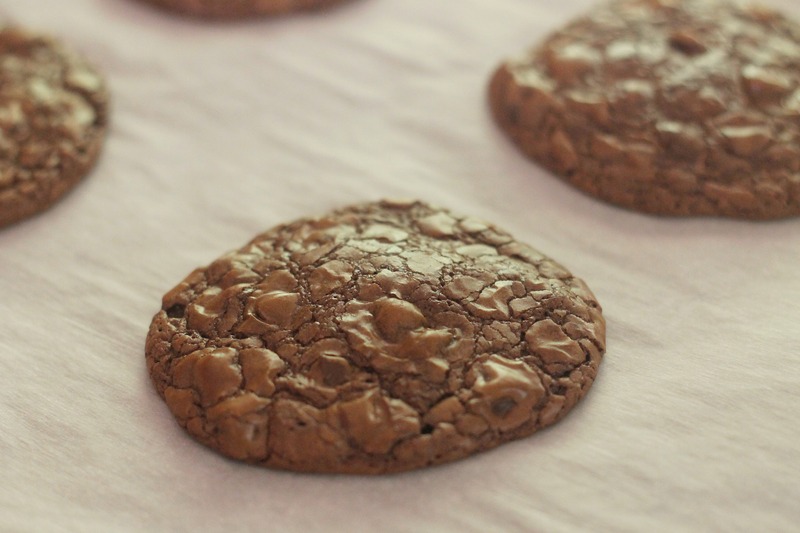 The edges are slightly chewy/crispy (the best part of any good brownie or cookie, no doubt) and the center melts in your mouth. The top has that nice crackled look associated with brownies. They are quite simple to make and very, very good! We actually brought these to a youth group event (sorry, these were not just for our blog anniversary), and there were only two left at the end of the night- everyone seemed to like them. We hope you will celebrate our blog anniversary with us and try these wonderful cookies! In a medium saucepan over low heat, melt the chocolate and butter together. Stir frequently and keep the heat low so your chocolate doesn’t scorch. Meanwhile, whisk together the flour, baking powder, and salt and set aside. In the bowl of a stand mixer, beat eggs, brown sugar, and vanilla on high speed until the sugar has completely dissolved and the mixture is aerated and silky-smooth (4-5 minutes). Reduce the speed to low and add the melted (and cooled) chocolate mixture. Mix until smooth, scraping the sides of the bowl with a spatula. Add the flour mixture and mix until just combined. Add the chocolate chips or chunks. 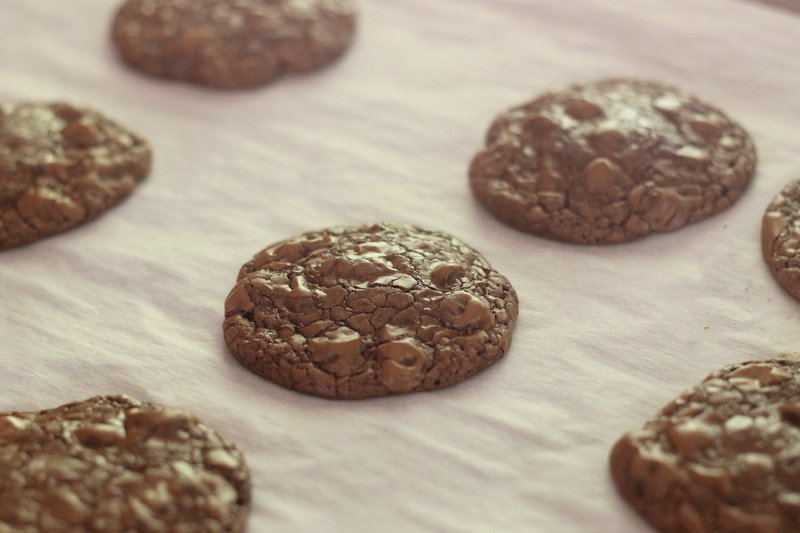 Put the dough in the freezer for about 10-15 minutes to prevent the cookies from becoming too thin.Drop the dough by tablespoon about 2 or 3 inches apart on the prepared baking sheets. Bake the cookies, rotating the sheets halfway through, or until the cookies are crackled and shiny and nearly set in the center. The cookies should still be slightly soft. Let the cookies cool on the baking sheet for at least 10 minutes, and then transfer to a cooling rack to let them cool completely. But who are we kidding, how long will they last warm out of the oven? Enjoy!